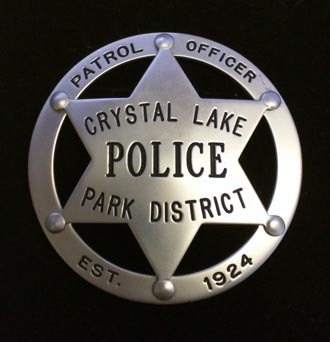 It is the mission of the Crystal Lake Park District Police Department to be conservators of the peace and protectors of the life and well-being of all patrons, citizens and park district property. 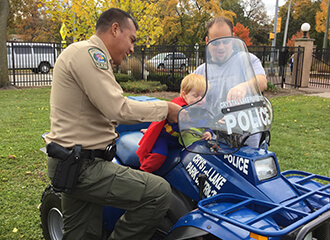 We will do this by providing service, reducing fear of crime, and relentlessly pursuing those engaged in criminal behavior through unwavering dedication, courage, integrity and ethical treatment of all we serve. We swear on our oath and the law enforcement officer's code of ethics to complete this with courtesy, professionalism and respect. Parks are open Dawn-Dusk. Park District facilities have posted hours of operation. Contact or visit the facility webpage to confirm hours of operation. No person shall be allowed on park property between dusk and dawn, unless otherwise authorized by the Director or when attending an authorized meeting or activity being held in a district facility. No person shall be allowed at any time, for any reason, on any park site or property that is declared closed by the Director or their designate. Dogs and cats are not allowed within playground borders or areas as otherwise marked. 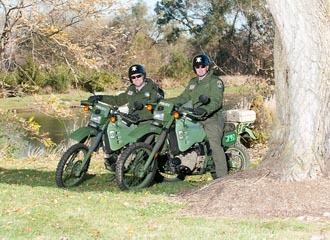 All other animals, including horses, are prohibited unless authorized by the Park Board of Commissioners. The person bringing the animal into the park area is responsible for removal of any defecation created by that animal. Animals are prohibited at Main Beach and West Beach. A. 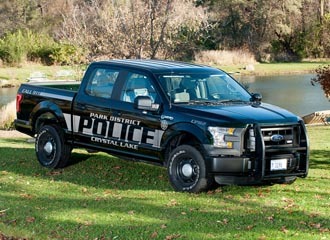 It shall be unlawful on any Park District property for any person to park any vehicle except within designated parking areas. No person shall offer or exchange for sale any article or thing, or do any hawking, peddling, or soliciting, or solicit or receive contributions of money or anything of value upon Park District property, unless authorized by the Park Board. A. The erection or maintenance of any sign, bill, poster, placard, or card; or the distributing of any advertising matter by handbills, or otherwise, except signs posted by the Park District, is prohibited upon Park District property unless authorized by the Park Board or its agent. Beer and wine are permitted at Main and West Beach in the picnic areas only; the Racket Club during special events; and the Rotary Building as approved by the Executive Director. Beer and wine may be consumed at Veteran Acres when approved as part of a picnic or shelter reservation or permit. Beer and wine may be consumed at Lippold Park when purchased from Park District vending only and in compliance with City and State licenses. Consumption of alcohol in other individual programs and buildings must each be approved by the Executive Director. The Park District reserves the right to prohibit alcohol in any/all parks/buildings at any time it deems necessary. 1. No person under the age of twenty-one (21) shall purchase, possess, consume, be under the affects of, or transport any alcoholic beverage on Park District property. 2. No person shall give, provide, sell or offer any alcoholic beverage to any person under the age of 21 years old on park property. A. Unlawful: No person under the age of 18 shall purchase, accept, possess or consume any cigar, cigarette, smokeless tobacco or tobacco in any of its forms. B. Furnishing Tobacco: No person shall sell, buy for, distribute samples of or furnish any cigar, cigarette, smokeless tobacco in any of its forms, to any person under the age of 18. C. No person shall smoke any cigar, cigarette, or pipe within a designated "NO SMOKING" area or if not marked, a minimum of 15 feet of any building entrance, exit, window that is open, or ventilation intake that serves an enclosed area where smoking is prohibited in violation of the "Smoke Free Illinois Act" 410 ILCS 82/1, et seq., as may be amended from time to time. D. No person shall smoke any cigar, cigarette, or pipe on or within any building located on Park District Property in violation of the "Smoke Free Illinois Act" 410 ILCS 82/1, et seq., as may be amended from time to time. E. No person shall smoke any cigar, cigarette or pipe within the fenced in property commonly referred to as Main Beach or West Beach. 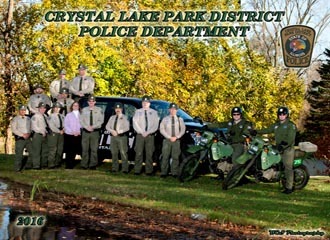 Wading into any park district body of water, other than Crystal Lake, to fish is prohibited. Fishing is allowed from shore or from piers installed for that purpose. A. All Illinois Department of Natural Resources Fishing Regulations will be enforced. C. All fish caught must be taken or released unharmed and in live condition subject to the provisions of this section. D. Each fish is a separate violation. As citizens and taxpayers we are all paying to repair this unnecessary damage. Tips from concerned citizens have helped to decrease the amount of vandalism damage each year. If you have a tip for police you can report in any one of the following ways.